At a party not long ago, I met Nick Stockton, a journalist who had just relocated to San Francisco. A reporter for Wired, Nick said he had come from New York but that he was originally from California. “Northern California?” I asked. He said no. “Oh, where in SoCal?” I followed. “Actually, I’m from the part of the state no one thinks about,” he replied. He was from Shafter, a small agricultural town in the Central Valley. It was an embarrassing moment. It hadn’t crossed my mind that a professional journalist from California might have come from anywhere other the greater San Francisco or Los Angeles areas. Maybe San Diego. But while that was a prejudiced and dumb assumption on my part, unfortunately it wasn’t entirely unfounded. “Nobody leaves, ever,” Stockton says of his hometown. Heading to New York for journalism school and then taking a job with Condé Nast in San Francisco was not a standard trajectory. Stockton was talking about leaving town in a literal sense, but lack of mobility is an increasing problem in the United States in more ways than just that. By many measures, socioeconomic mobility—a key component of the American dream—is becoming in America even more of a dream and less a reality. It’s easy to look at an adult’s life—whether they go to college or stock shelves or spend time in prison—as the result of personal decisions. And that’s not entirely wrong. But our decisions are shaped, and too frequently limited, by where we live. One way to visualize this is by looking at how life outcomes cluster geographically. 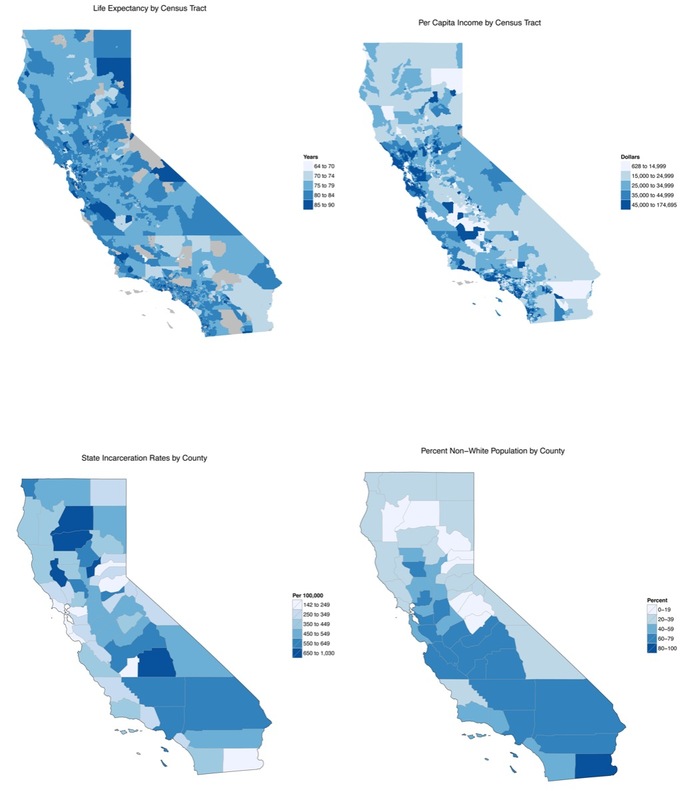 In 2012, researchers at Virginia Commonwealth University dug into health statistics for Alameda County, where I live. Alameda is home to the University of California, Berkeley and is just across the bay from San Francisco. Not surprisingly, there are neighborhoods where people are doing quite well. But that’s only part of the story. In their report, part of a series called Place Matters, the researchers found differences in life expectancy of more than twenty years between neighborhoods in the same county. Poverty, education, and income levels all showed huge variations. You can predict a lot about a person by where he or she lives. Start with life expectancy. If you want to reduce health and quality of life to a single number, it’s hard to do much better. Exercise, diet, income, stress—they all affect how long a person lives. And average life expectancy incorporates the effects of violence, as well; if a high proportion of young men are dying, that can bring down an overall average. Data sources: per capita income by census tract and race by county from the United States Census 2013 American Community Survey. 2010 life expectancy by census tract from Virginia Commonwealth University (VCU) Center on Human Needs (CHN). Count incarceration rates created from the California Department of Corrections “Year at a Glance” 2010 report, which gave the county of commitment, with thanks to the Prison Policy Initiative. I used 2013 American Community Survey population data to generate the rates.